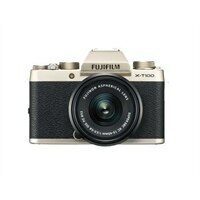 Fujifilm X Series X-T100 - Digital camera - mirrorless - 24.2 MP - APS-C - 4K / 15 fps - 3x optical zoom - Fujinon XC 15-45mm OIS PZ lens - Wi-Fi, Bluetooth - champagne goldRetro styled, portable in size and built around a powerful 24-megapixel APS-C CMOS sensor, the Fujifilm X-T100 mirrorless digital camera is the ideal companion for creative everyday photography. Packed full of high spec features such as an advanced hybrid autofocus system that's able to keep pace with even the most active subjects, a speedy 6fps continuous shooting mode, high-resolution electronic viewfinder and intuitive swiveling touch screen, it brings professional image making into everyone's grasp. Boasting an always-on Bluetooth connection, the X-T100 connects seamlessly with your smart devices via built-in Wi-Fi connection to instantly transfer your images. Retro styled, portable in size and built around a powerful 24-megapixel APS-C CMOS sensor, the Fujifilm X-T100 mirrorless digital camera is the ideal companion for creative everyday photography. Packed full of high spec features such as an advanced hybrid autofocus system that's able to keep pace with even the most active subjects, a speedy 6fps continuous shooting mode, high-resolution electronic viewfinder and intuitive swiveling touch screen, it brings professional image making into everyone's grasp. Boasting an always-on Bluetooth connection, the X-T100 connects seamlessly with your smart devices via built-in Wi-Fi connection to instantly transfer your images.